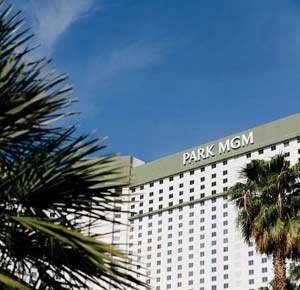 The Park MGM Hotel is a premier Las Vegas resort located right on the strip. This AAA Four Diamond resort offers 3,002 truly luxurious accommodations. Whether you stay in the Park MGM Hotel's Deluxe Rooms, Park MGM Las Vegas Monaco Suites, Spa Suites, or Diamond Suites, you will be able to relax and unwind after an exciting day on the trip. At the Park MGM Hotel, even the basic rooms are deluxe. The Deluxe rooms offer 400 square feet of space, and the are opulently decorated in upscale cherry wood furniture. Standard amenities such as a daily newspaper and hairdryer are included in all rooms. The Monaco Suites are an even more luxurious 700 square feet, with whirlpool tubs and king sized beds. Park MGM Las Vegas Spa Suites have an even larger spa bathtub and offer amazing views of the Las Vegas strip. A state of the art surround sound system sets the mood. Any high roller will enjoy the Diamond Suites, which provide 825 square feet of Italian-inspired luxury. The Park MGM Resort and Casino brings high-quality entertainment options to its guests. Lance Burton is a world-famous illusionist who will delight and astound you. If you prefer comedy to magic, Frank Caliendo is known for his hilarious impersonations and stand up. In addition to its two resident entertainers, the Park MGM hotel Las Vegas also hosts many travelling acts throughout the year. Check with the resort to see who will be performing during your stay. Of course, there is also the Park MGM casino itself, where you can play table games, try your hand at slots, or play a round of poker. Sports and event betting is also offered. Experienced magician Lance Burton pulls audiences into a world of classic magic and illusions night after night. A High-energy, hot-bodied musical act. Now with high drama, spilling over from their pesonal lives! Making fun of W. and John Madden has never been more fun. If gambling is not your activity of choice or if you simply need to take a break from the slots, the Park MGM Hotel offers many other enjoyable amenities. Guests of the Park MGM Hotel Vegas can relax at the spa, which offers traditional services such as massages and facials. There is also a salon on the premise so that you can look your best when you hit the strip. If you need to buy a special outfit for your night out, there are upscale boutiques on the property as well as souvenir and specialty shops, such as Art of Music and Harley Davison. You and your traveling companions can also relax around the pool. Cabana rentals are available for a fee. The intensity of Las Vegas can batter an unprepared visitor. Rejuvenate with a spa visit. A fantastic team of professional stylists will transform guests of the salon. Ample equipment is available to suit the needs of everyone. That's right, "Pools." Long or wide, shallow or deep, the Park MGM's pool complex is diverse and entertaining. When you want to take a break from the fun and excitement in Vegas and enjoy a delicious meal, the Park MGM boasts a buffet of options. Diablo's Cantina is a popular eatery that serves Mexican-inspired cuisine. If you are in the mood for Italian, check out d.vino Italian food and wine bar. If you need to grab a quick bite before you head out to one of Las Vegas' many attractions, Dragon Noodle is a fast option. There is also a food court with a wide variety of eateries, including Starbucks and McDonalds. No trip to Vegas is complete without a visit to a casino. The Park MGM casino is one of the best gaming facilities on the strip. The Park MGM casino Las Vegas has over 1,600 slot machines. There are penny slot machines and slots that cost one hundred dollars a spin. If you prefer cards to slots, there are dozens of table games to choose from, including Roulette, Caribbean Stud, Crazy 4 Poker, and Texas Hold 'em. For the dedicated poker players, there is a separate poker room so that you can concentrate on your game. The Park MGM resort also has a sports betting facility.